This building is constructed and gives an impression if it was a white tree. The rooms and the balconies spread out like branches of a tree. 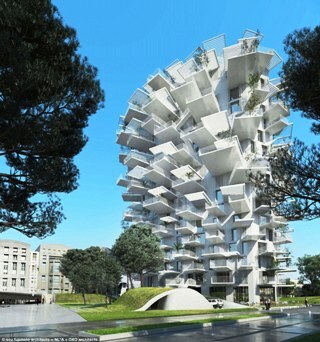 This 17 story building is being readied in the city of Montpellier, France. The tower depicts the abilities of Architects of the present times. The building will be located in the centre of the city. Facilities have been provided like Offices, residences, a penthouse bar and first floor restaurant, an art gallery. The residents will be free to choose any architecture only that the apartments should accutally be branch of a tree trunk. Floor plan can be designed as per occupants choice. Thus, all concerned will be mostly satisfied. The view is important for any building with a taste. Therefore, a panoramic view of Montpellier along with the Pic Saint-Loup mountains, the Lez River and the sea ( Mediterranean Sea) has been prominently kept in mind.The building is to be provided a penthouse with bar, offices and an art gallery plus the apartments.The unique feature of stairs – step balconies jutting out of the trunk of the central trunk is most note worthy. The Architects have given importance to the concept of tree growing. The balconies will have the facility of giving shade to the adjacent apartments. The city’s skyline is expected to change superbly and it will be love at first sight for one and all. A thing of beauty is joy forever. The towers designers are Nicolas Laisné Associés and Japanese Sou Fujimoto, Oxo architects.